So it seems that Starbucks customers at drive-throughs across America have been paying for the next customer behind them. 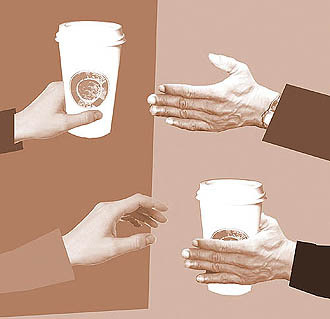 I’ve yet to be on the receiving end of such a random act of kindness (when it comes, make mine an extra large, triple shot, mocha-choca-latte with whipped cream and syrup and a sponge cake and coffee cake on the side), but I was interested to see what it’s all about. At first, I understood “random” to mean an act towards someone you don’t necessarily know or imagine to meet again, but I believe in this case it relates more to the unexpected element in a gesture. 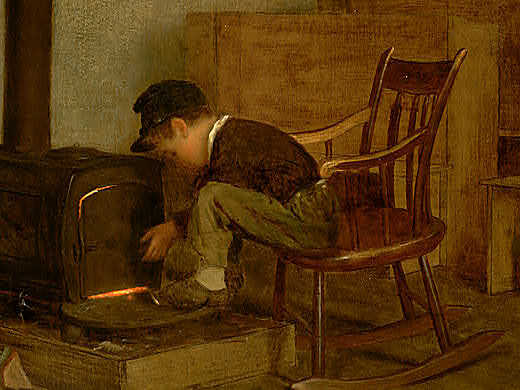 And that’s what I see here, in this little helper who had my heart from the start: The Early Scholar is by the American Eastman Johnson (1824 – 1906). Born on the east coast, Johnson ‘burst’ onto the art scene with a crayon-portrait studio at the age of 18, before moving to Washington, DC to make black and white likenesses of eminent figures. 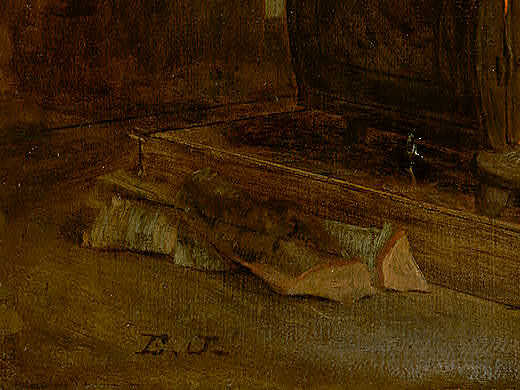 It was in 1849 that his training took off in earnest however, with an extended study-stay in Europe: he did drawing at the Düsseldorf academy in Germany, and painting in an artist’s studio close by, before heading off to the Hague in Holland. Johnson was among the first American artists of his generation to receive extensive training abroad. His stint in the Netherlands (three years in all) was highly unusual for an American artist at the time and it was no doubt the start of his art in genre scenes (images of everyday life, in which the Dutch Old Master tradition excels). During the 1860s and 1870s Johnson became one of his country’s most sought-after specialists in this area (our picture today dates to c. 1865). The Early Scholar has him looking at national life in the most home-oriented and humble way. A work like this would have been the end result of careful study and numerous charcoal and oil sketches, a kind of concentration that mirrors that of the character seen here. What I think works well is the way he strips the scene to a bare-bones state: it’s so close-colored all of this, with little emphasis on tonal variety. The composition is simple, with a sliding diagonal on the right and an array of verticals on the left bringing the eye to the quiet action taking place in the middle. 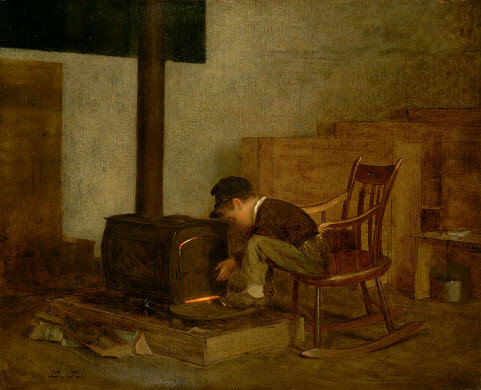 There, a sliver of hot color and a peek at the profile of a concentrated lad concentrate our eye on his simple act: rocked forward on his chair, hand held on the stove door, it radiates warmth and human connection. There are lots of backed-up benefits to expressing kindness, apparently: it nurtures healthy relationships, as well as good mental and physical health, and gives a “helper’s high”. Indeed, do it regularly enough, and random acts of kindness procure a happiness state equivalent to that of getting a college degree or more than doubling your income. So, certainly sign me up for some of that! And I’ll see you in Starbucks (you’ve got my order). Next > Over and Out?